In Part One I spoke about the differences in gustatory delights between Paris and Roma. We also have a number of observations to make about architecture, mobility, and behavior. 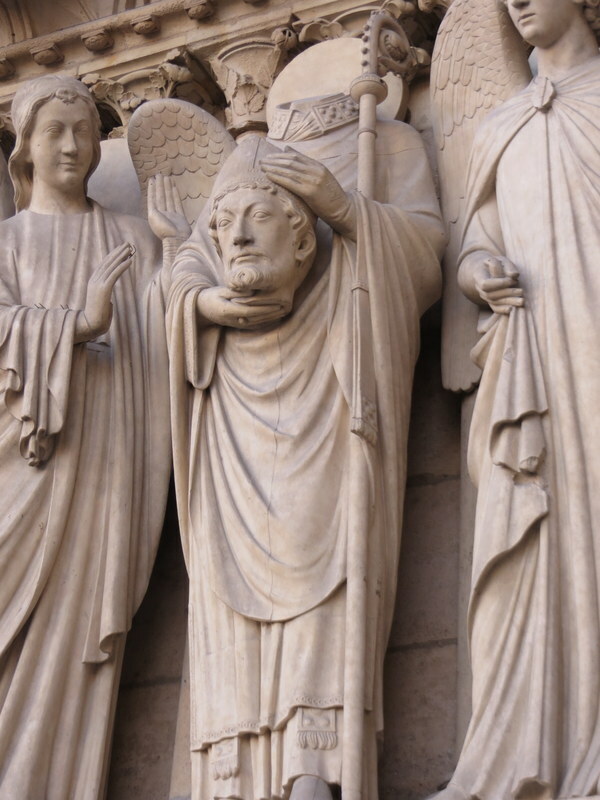 Saint Dennis holding his head, facade of Notre Dame. When we travel we like to settle in for a long stay. No “Paris-in-three-days” whirlwind for us! We saw one museum a day, at most, and spent plenty of time wandering neighborhoods both wealthy and moderate. We rented an apartment in the 17th arrondissment, managing to stay under our goal of €100.00 per night. It was nothing fancy yet everything we needed. This approach let us observe local life: children going to school, city workers, mothers and fathers, the elderly doing their shopping, transportation systems, and maybe just figure out a little how a place works, what it might be like to live there. 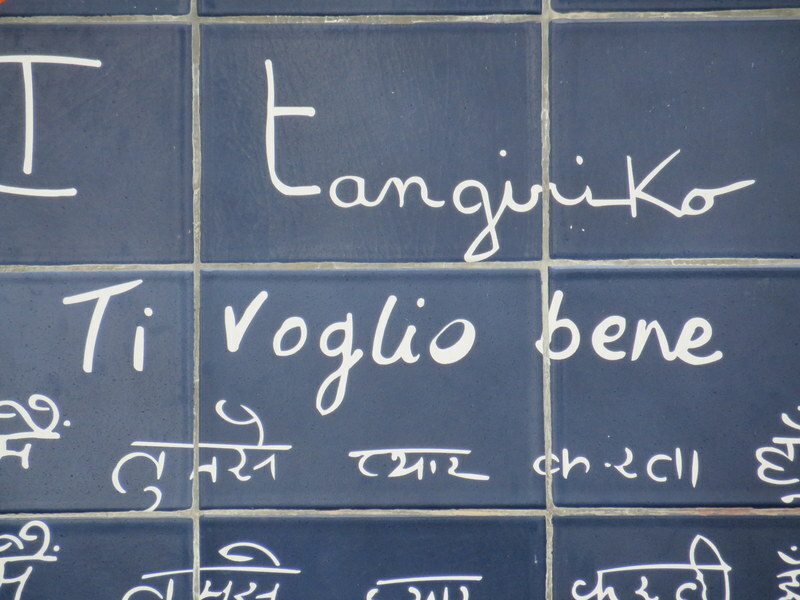 Thus a few words on the streets of Paris versus Rome. 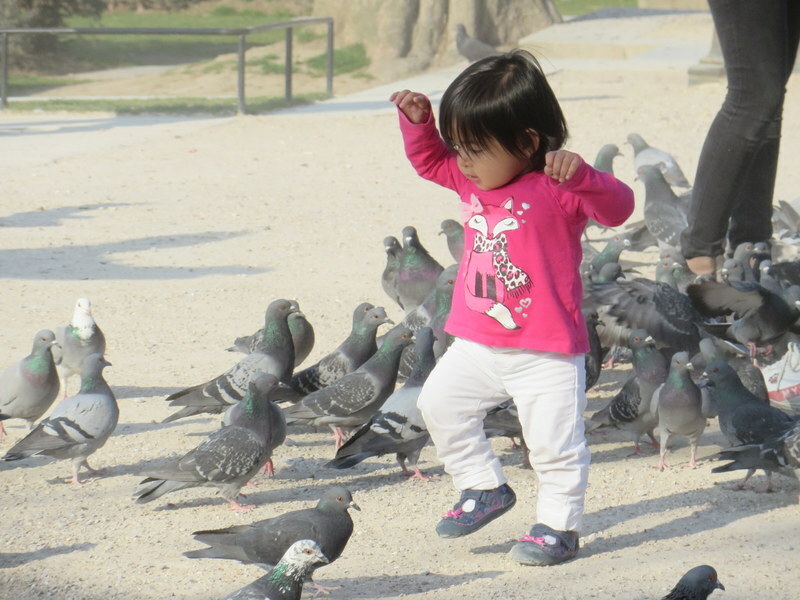 This little girl was endlessly fascinated by the pigeons. is made possible by an amazing system of street cleaning involving surging water and workers with brooms. We first feared all the crap ended up in the River Seine, but lo-and-behold found this explanation. Cigarette butts and other small debris is washed away, and larger items are bagged by the workers. In Roma it is a never-ending battle for city workers against messy denizens. If a trash bin is overflowing, they leave their bags on the street, never mind there’s an empty bin 50 yards further on. Of course in Roma graffiti is art (sometimes) and after all, it was invented by the Romans. Old-fashioned street cleaning trucks make their way down the street very few days and hose down the debris, sweeping up some of it. Paris’ grand old Haussmann buildings are elegant and the straight streets make navigation on foot easy. The wide tree-lined avenues and boulevards allow one to see far in each direction. Cars are parked in an organized fashion and pedestrian crossings are left open for, well, pedestrians to cross. There are pleasant manicured parks that illustrate design principles. In Roma every building is an individual, many are very pretty, and most are the same height regulated to not exceed the height of St. Peter’s. We have ancient sites preserved and visible almost everywhere and ancient walls and columns are oft incorporated into new buildings (if by “new” you can accept 400 years as “new”). But we have the ugly serrande pulled down over shops and restaurants and covered with graffiti. Not a pretty street presence, those. 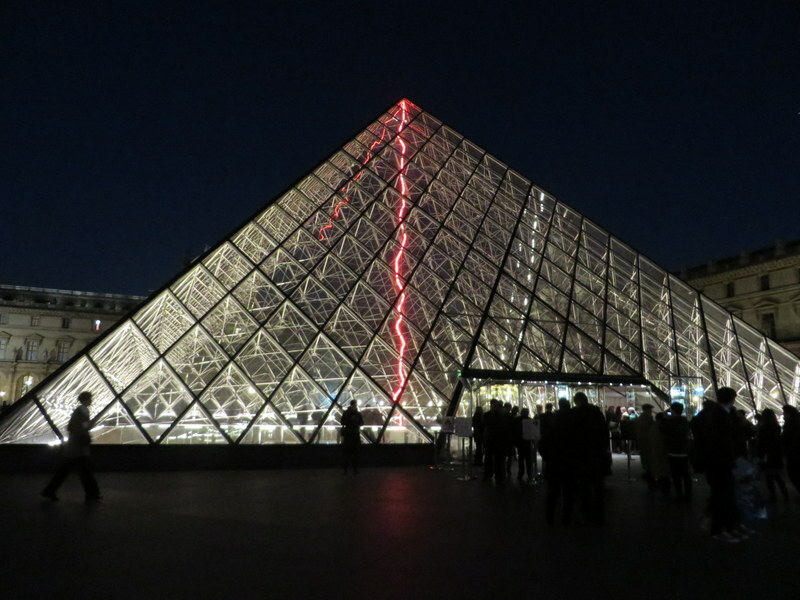 The Louvre featured an installation of neon art. neighborhoods. They may start by radiating off a piazza, but soon change direction and probably name. Finding your way is a nightmare until you’ve spent considerable time in the city. Trees are scattered, but on the other hand, Rome has some great green spaces (Villa Borghese, Villa Torlonia, Villa Ada, Villa Doria Pamphilj) and fountains running year ‘round. In Paris we did not see a fountain “on” in March. Parking in Roma shows little respect for property or other people’s rights-of-way. White stripes in the pedestrian crossings are free parking, right? Double-parking is a constant battle for buses trying to weave through the already narrow streets. In Paris we have not seen such abuse of parking. It is very orderly and it seems there are plenty of parcheggi (parking lots). 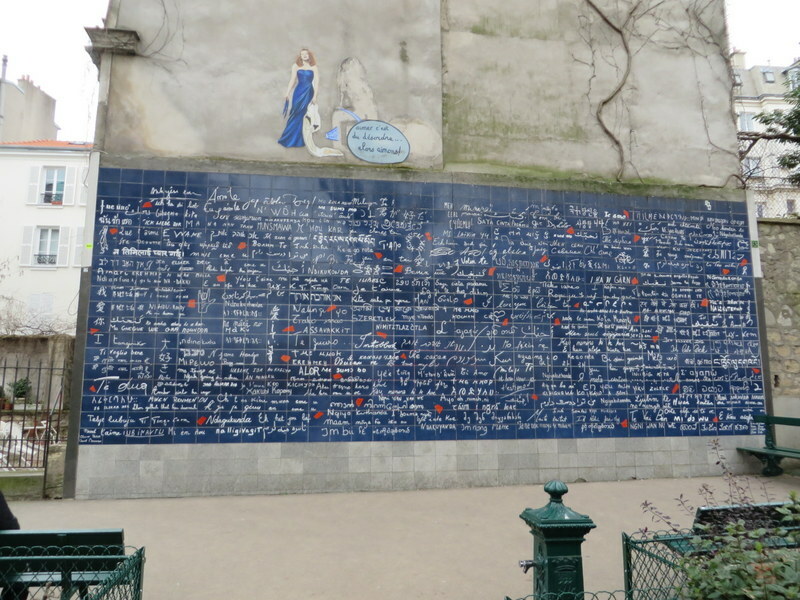 “I love you” wall in Montmarte. Cats are absent in Paris. We did not see one cat in a week in Paris. I conjectured that perhaps they are all coddled little Fluffies tucked up in their Haussmann apartments. According to one Parisian I am probably right: they are house cats. Still, no ferals? We walked through residential areas and did see not one cat in a churchyard or courtyard or sitting on a wall. In Roma, a cat outdoors is not only a common sight, there are the gattare, women who feed the cats in the streets. There seemed to be fewer dogs in Paris than in Roma, and thus less dog poop on the sidewalks. observing people. Good for them! In Roma, police/military presence is here-and-there and likely to involve five officers in a tight circle talking about soccer. 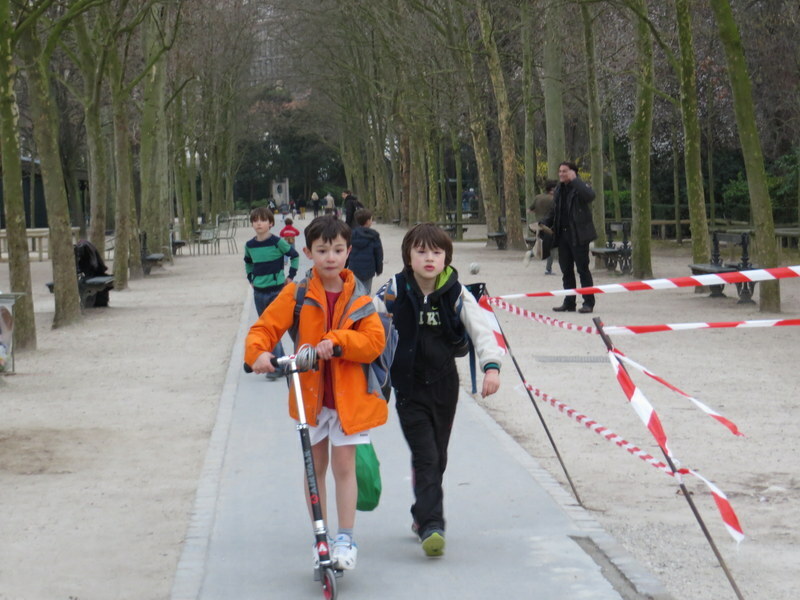 We did not encounter as much trouble with pedestrians hogging the sidewalks in Paris as we face in Roma. In Roma, groups of people will walk 3, 4, and 5 abreast acting indignant if they have to move for oncoming pedestrians. An old lady with a shopping bag can somehow occupy the entire sidewalk as she shuffles along weaving from side to side as if to thwart anyone from passing her. In Paris people made way as one might expect in crowded situations. If you have not encountered the difference yourself it is hard to describe, but many Romans seem to be so self-absorbed they are unaware of other people needing to pass and use the sidewalks. I call them sidewalk hogs. Ah the Paris Metro! It goes everywhere! People enter the buses from the front, validate their tickets and passes, and exit only from the middle. Che bello! There are seats in both Metro and buses! People stand back and allow others to exit the Metro before forcing their way on, and it is QUIET! One day as we were riding, a guy answered a cell phone call while on the bus and got the stink-eye from an older couple. Any talking is done in hushed tones. Roma? Chaos! On the bus, enter or exit any door, validate if you feel like it. Noisy? You bet! Several loud cell phone conversations are punctuated with loud talk and laughter. Why not catch up calling your mamma in Bangladesh (pennies a minute according to the ads!) while commuting half-an-hour? Talk loud too be sure she can hear you over the noise of the bus. In Roma it is hard to get OFF the Metro or bus as the incoming traffic is pushing their way on. Young men fight old ladies for the few seats. Scooters were everywhere, ridden by both children and adults. 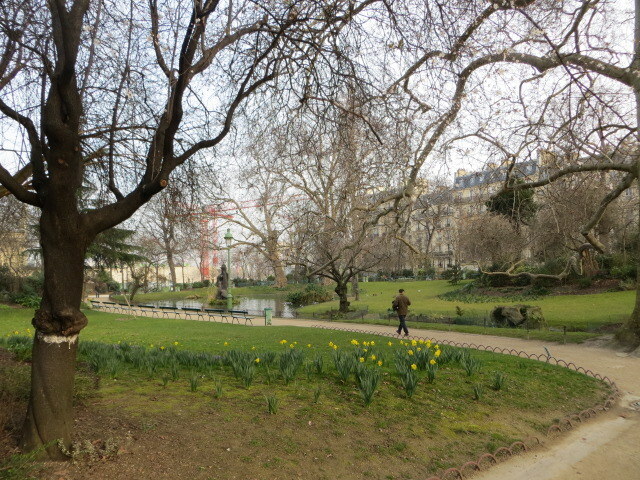 Here in Luxembourg Gardens. The Parisian buses are on a schedule! A real schedule! You can go to the RATP trip planner and be told – several hours in advance – when your bus will arrive at your stop. Che meraviglioso! At each bus stop there is an electronic feed telling you when the next bus will actually arrive. Roma has a few of the electronic signs at downtown stops, but there is nothing resembling a schedule. There are departure times posted for each capolinea, but very rarely are these schedules followed. 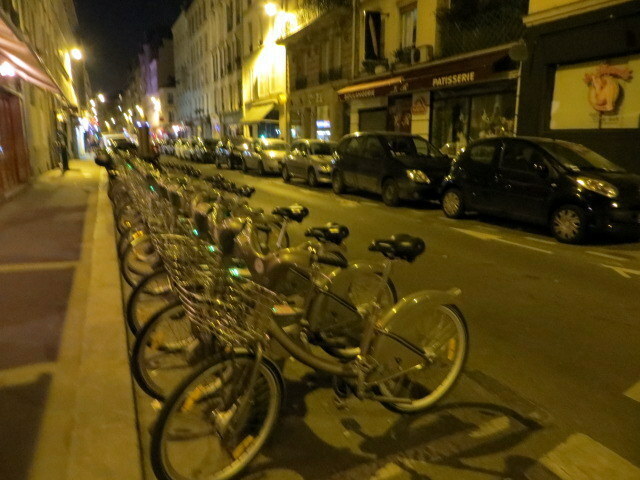 Velib bikes all tucked away at night. During the day the racks were empty, all bikes in use. Where in Roma one might be run down by a motorino, in Paris a bicycle might sneak up and knock you flat. 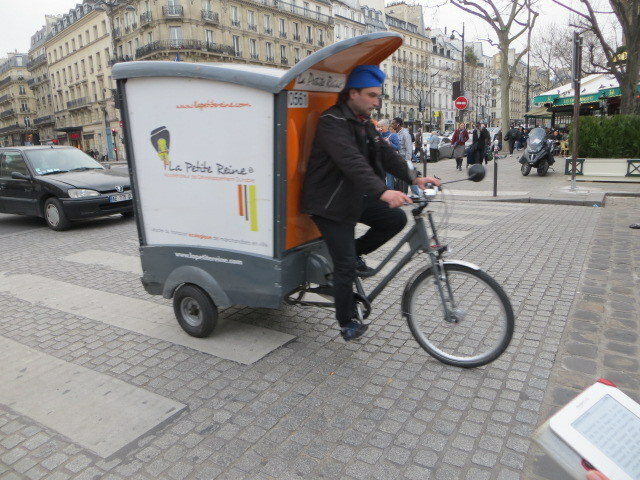 The Velib system of bike rentals is very popular. We’d see racks full with 20-or-so bikes in the early mornings and late at night, but during the day they would all be checked out through an efficient subscription system accessible to tourists as well as residents. There are bike lanes in Paris (very few in Roma) that run counter to the direction of cars in one-way streets, so while looking right to see if traffic is clear, a jay-walker might be surprised by a bicycle silently approaching from the left. We were unimpressed by the famous TGV high-speed train run by SNCF, except for the price. Look at the little yellow safety vests the children are wearing! So cute and easy to identify! We paid less to go from Milan to Paris than from Rome to Milan in order to catch the TGV. However, there were no courtesy beverages like on Trenitalia, and overall we felt the trains were dingy inside and out. The food was overpriced and marginal, and when you are on a train for 7.5 hours, you want need food. Still, we did not have to deal with an airport, and that is always a plus. Food: Italy for the win! While ethnic selections are few, wine, coffee, quality, healthfulness, and price are all in the positive column for Italy. Paris gets points for baguette. The French pastries and chocolates are amazing, and I prefer pain au chocolat to an Italian cornetto. Much flakier and delicate. The Boeuf Bourguignon at one tiny little bistro we found would be reason enough to go back to Paris. Wine: Scales tip to Roma again. Quality at every price point. In Paris we got very good wine only at a price we find unacceptable for daily consumption. 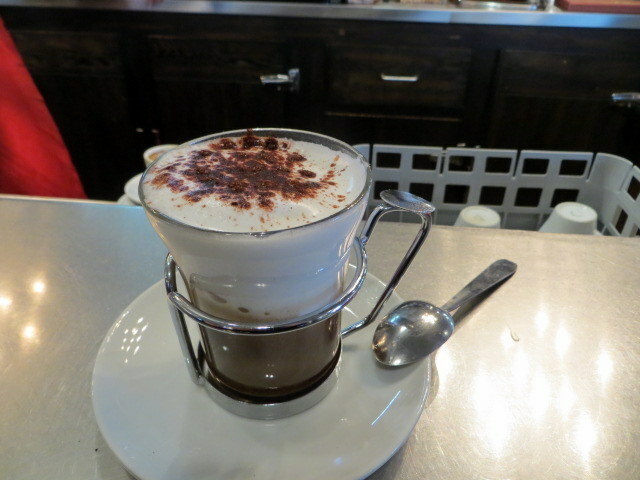 Great cappuccino at a neighborhood cafe, where locals go. This was not by a tourist attraction. We drank it at the bar and still it was €4.20 FOR ONE. I shudder to think of what they would have charged if we sat down. Coffee: Roma for price and availability; Parisian baristas pour a good shot, but the cost is at least double most bars in Roma. Architecture: Tie. 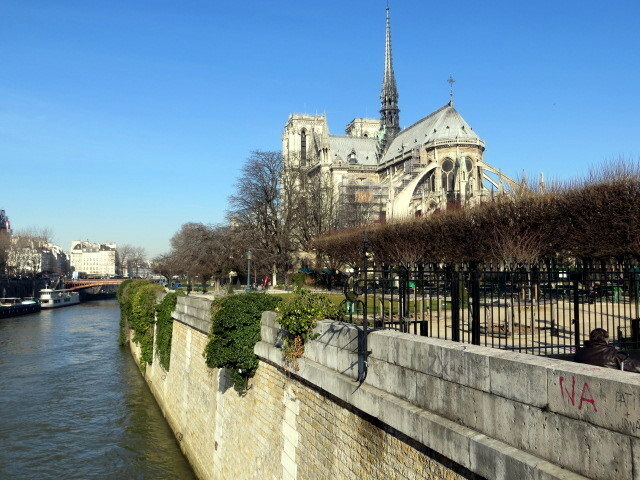 Paris for elegance, Roma for quaint, ancient, charm. Parks: Tie. Each city has nice green spaces. Paris’ are more formal, Roma’s more casual, even a bit wild. Cleanliness: Paris by far! The street cleaning system of Eugène Belgrand is pure genius. City workers are very prominent in tidying up as well. Transportation/Getting Around: Paris by a mile. The Metro is omnipresent, the buses on time and predictable. In Roma even the bus app we have on our smartphones cannot always predict when the bus will come. People park where they should in Paris, you do not get run over by motorini, and the availability and use of bicycles is laudable. The narcissism of Roman drivers with cars blocking pedestrian crossings and double-parking makes it difficult for buses and walkers to maneuver. The narcissistic self-absorption of pedestrians in Roma makes it difficult to walk down the street without getting knocked into. In Roma, people will walk out of a shop door without looking right or left and run into you. They are quick to apologize, but the behavior never changes as far as I can tell. Rant over. 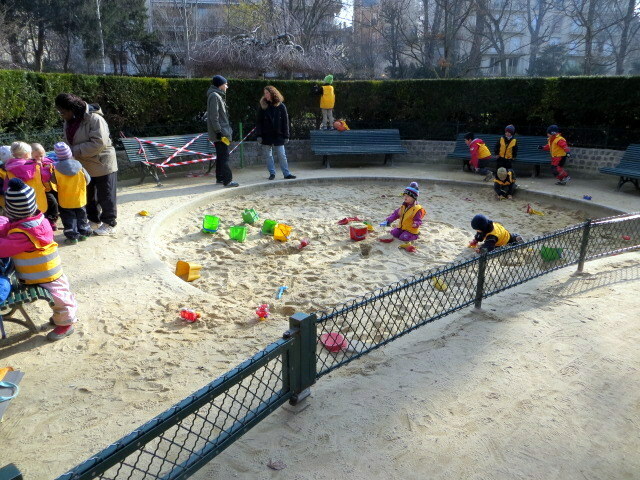 Park near our apartment in the 17th. Do you recall seeing a giant bronzed rhinoceros? It sits in front of the Musee’ d’Orsay. It is the Voruz rhino! Donated by Scott’s family in 1878. It’s one of the few things I remember from our trip to Paris 22 years ago.